January is a time of change and improvement for many. With New Years’ Resolutions still fresh and practiced, the coldest days of winter are filled with optimism. The event services industry shares that mindset. 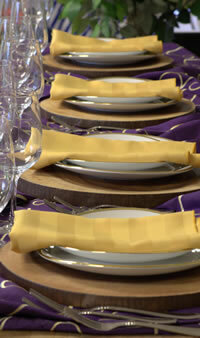 In fact, A to Z Party Rental is also improving and changing as the winter months linger over southeast Pennsylvania. 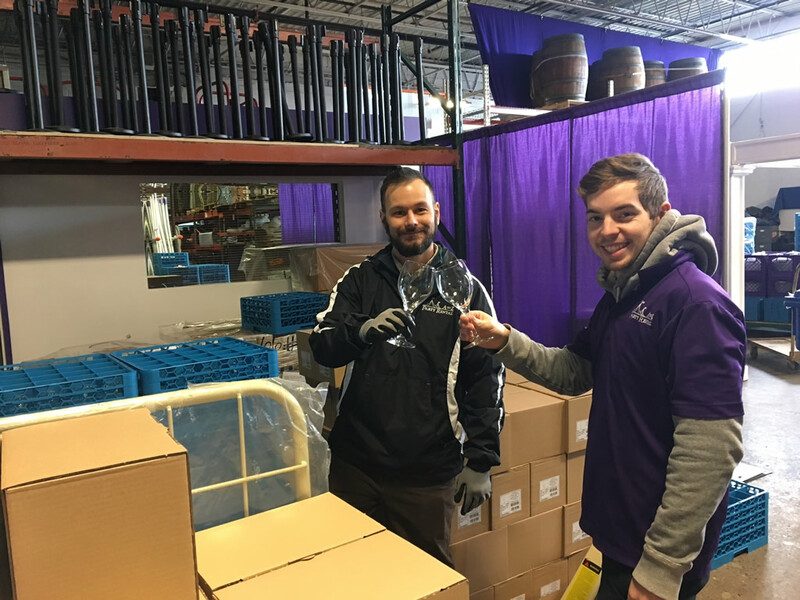 In addition to creating more storage in previously underutilized areas of our Montgomeryville warehouse, new products are being delivered each day. Checking in all of the new deliveries requires all hands on deck! From hundreds of glasses to thousands of pieces of flatware, we are increasing the amount and adding new styles to the already-lavish table settings we offer. Our brand-new tabletop convection ovens, fresh out of the box and headed to the kitchen! To accompany the new glass and flatware, a pair of Tabletop Convection Ovens has been added to our rentable inventory. Unlike most convection ovens, our new ovens do not require propane. They plug into a standard 120 volt outlet and fit up to three half-sheet pans. These ovens fit perfectly on a countertop and are ideal for hors d’oeuvres or personal-sized pizzas. In addition to table settings, we are increasing the counts on all three styles of metal folding chairs – bone, white wedding and black and chrome – by nearly 50 percent. 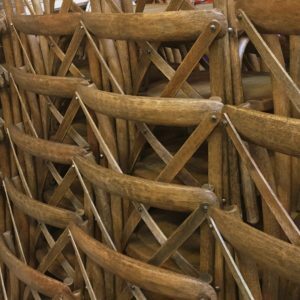 Lots and lots of new chairs for your 2017 events! If you are attending a high school or college graduation in the Montgomery, Bucks or Delaware counties, chances are your loved one is sitting in an A to Z chair eagerly awaiting their opportunity to toss their cap into the air. Further, our new farm collection is sure to be a hit in the upcoming season. 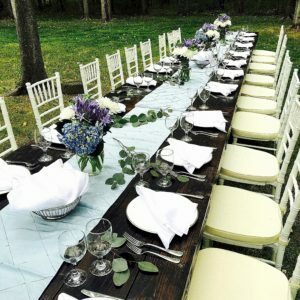 Perfect for backyard parties or outdoor corporate events, our Farm Tables and Cross-back Farm Chairs coordinate with one another and with any backdrop. Dark mocha in color, our table seats eight to ten people. Whether it is an intimate get together or large graduation party, these tables will satisfy your event. 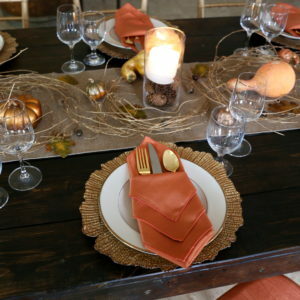 Skip the cheap plastic tables you get from the department store and wow your family and friends with a gorgeous farm table with the perfect backdrop of your backyard. Words can’t properly convey the quality and beauty of our items. To get the full experience, stop by our showroom to try out the items and see them in a real-life setting. 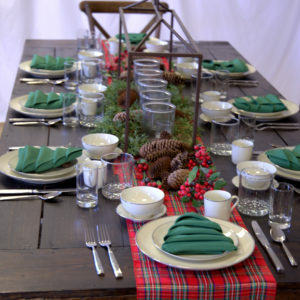 Our Farm Table with a cozy holiday setting. This table looks great indoors or out! As we continue to grow we are also trying to give our customers more of an experience. We want to be a partner with you to plan your event, not just a vendor. We can answer any question you have about what plates will serve your guests better, how to set up the perfect buffet for your Super Bowl party or what yard games will suit your graduation party best. If you visit our showroom, our event design specialists will certainly make your event planning an experience, not just a task. With the internal demand becoming higher for quality and the external demand becoming higher for the quantity and variety of our products and services, our New Years’ Resolution is to continue to exceed all of those demands.